Adele Vrana is Co-Director of Whose Knowledge?. Adele has led business development and partnerships initiatives to help build a more plural and diverse communities in her native country of Brazil and globally. She is the former Director of Strategic Partnerships at the Wikimedia Foundation and a 2015 Erasmus Prize laureate on behalf of her work to expand access to Wikipedia in the Global South. Adele holds a BA in International Relations and a Master’s Degree in Political Science from the University of Sao Paulo. When not re-imagining what the internet of the future internet would look like and advocating for that online, Adele spends most of her time raising two feminist boys, reading black feminists from the Global South, and spending time with her friends from close and afar. Anasuya Sengupta is Co-Director of Whose Knowledge?. She has led initiatives in India and the USA, across the global South, and internationally for over 20 years, to amplify marginalised voices in virtual and physical worlds. She is the former Chief Grantmaking Officer at the Wikimedia Foundation and a 2017 Shuttleworth Fellow. She received a 2018 Internet and Society award from the Oxford Internet Institute. Anasuya holds an MPhil in Development Studies from the University of Oxford, where she studied as a Rhodes Scholar. She also has a BA in Economics (Honours) from Delhi University. When not rabble-rousing online, Anasuya builds and breaks pots, takes long walks by the ocean and in the redwoods, and contorts herself into yoga poses. Siko Bouterse is Co-Director of Whose Knowledge?. She’s organized, localized and imagined a more plural and truly global web for over 10 years. She is former Director of Community Resources at the Wikimedia Foundation. Siko has an MA in Middle East History from the American University in Cairo, where her award-winning thesis focused on social history not captured in traditional historical sources. 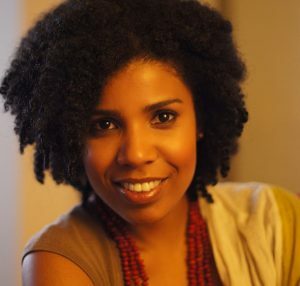 She also holds a BA in Anthropology from UC Berkeley where she worked at the Phoebe Hearst Museum. When not rabble-rousing online, Siko is paddleboarding in the ocean, cooking and reading about delicious feasts, making bad mixed-media art, and raising a feminist daughter. Claudia Pozo is Communications Lead of Whose Knowledge?. 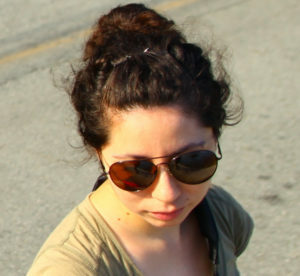 She is a Bolivian cyberfeminist, graphic designer, and digital rights activist devoted to bridging tech communities know-how with grassroots movements’ necessities. She holds a BA in Social Communications and a Master’s Degree in Development Management from the University of Agder in Norway. You will usually find her organizing training sessions on digital security, discussion panels on technopolitics, or drinking black tea while datamoshing late at night. Mariana Fossatti is Coordinator of our 2019 #VisibleWikiWomen Campaign. 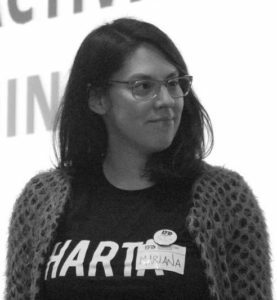 Mariana is a sociologist, visual artist, and activist in free culture, digital rights, and feminism from Uruguay. She’s involved in projects like the digital cultural center Ártica, the Uruguayan research group Laboratorio Datos y Sociedad (Datysoc), Wikimedia Uruguay (where, among other things, she’s coordinated several edit-a-thons about women), Creative Commons, the free software cooperative Librecoop, and Encuentro de Feministas Diversas.